Washington (CNN) - The Obama re-election team raised more money last month than any campaign has brought in this election cycle, a Democratic source familiar with the fund-raising totals confirmed to CNN. The campaign's September total is expected to exceed $150 million, the source said. - You can follow Kevin Bohn on twitter @KevinBohnCNN. That would top the previous monthly record of $114 million for Obama, set in August. Officials refused to comment on campaign fund-raising numbers as the donations are still being counted. The fund-raising information was first reported by the Wall Street Journal earlier Thursday. Making sure each campaign has plenty of cash is key as the critical final weeks of the campaign approach - especially with a vigorous and now escalating TV ad battle ongoing in at least eight swing states. September started with the Democratic National Convention and a well-received speech by former president Bill Clinton resulting in a bounce in the president's poll numbers. That helped solidify support for the re-election effort. Obama is jointly raising money with the Democratic National Committee just as Mitt Romney is doing so with the Republican National Committee. For Obama, August reversed a trend of several months in which Republicans out-raised the Democrats on the presidential front. Romney brought in $112 million in August. For the first time in history neither major presidential nominee is accepting federal matching funds in the general election campaign, only intensifying the chase for dollars. One advantage for the president has been his ability to attract more small donors who can repeatedly give while the Romney campaign has drawn more large dollar contributors. Obama's campaign earlier this week announced it raised money from more than 10 million individual donors. Romney officials have not yet indicated what their September fund-raising totals. Both campaigns have until October 20 to report their tallies to the Federal Election Commission. Rip this mitt–joe talk of 47%, all quotes let Detroit go bankrupt etc, Bain outsource in debate-raise voice in debate. Public is on your side. Mitt Robme is a FRAUD, cheat, lies,,,,,OBAMA12. Period. If campaigns are raising millions upon millions of dollars where is all this money coming from? Why should a campaign for the President of the United States require candidates to raise and spend this amount of money. Then we have the PACS who can raise millions upon millions and are not required to tell the American people where the money came from. Those contributing this money are not standing up to show their support of Mr. Romney. They are hiding behind the Supreme Court decision instead of being man or woman enough to stand up and be counted. Three things need fixing here. 2) Some kind of Per capita $ amount is allocated to presidential candidates, senators, and representatives and it is split 50 /50 on a government funded basis. National political or state parties can campaign for Funds up to the state and federal amounts plus 10 % for operating costs. 3) The how of each parties selection process for President or state senators or representatives comes out of per capita amounts. Pacs may spend only the same amount as the above limits and have to stae whom they support in order to determine the money limit a) by state and b) federally. The money this saves flows in to the economy interms of consumer spending or savings and investment + tax revenues that can be directed to education or other at the time Urgent matters. The current system is one that riskes money deciding who gets elected. Dear Obbie, please count on me, I am doing inexorable work on this election. Because I care for USA and its middle class Americans!!! God bless us all. PS: folks, go in groups with I.d please, all VOTE!!! Yea and now we learn it was because they received illegal funds from overseas. Yea great job at breaking the law. AGAIN! In response to the earlier comment about actors & Republicans.....Interestingly it is the Democrats who either elect comedians for office (Al Franken) or accept $1 million dollars from others (Bill Maher). I'm a die-hard Democrat, but is this all a part of the Democratic MOCKERY of Democracy? YEP, it sure is expensive to get elected! Wouldn't it be nice IF TV stations would have FREE time for candidates to spout their views & tell us "how good it is going to be" if we elect them? HA!! The other question, for me, is where does all this money come from? IF you just took HALF of it you could help others! Mitt is a liar – Vote for Obama and send more money to his campaign. Not only do we need to cast our vote but we need to support Obama's campaign with contributions because a vote without a check won't work. Time for us to put our money where our hearts are and battle those billionaires who are sending millions at a time to Romney and Rove. 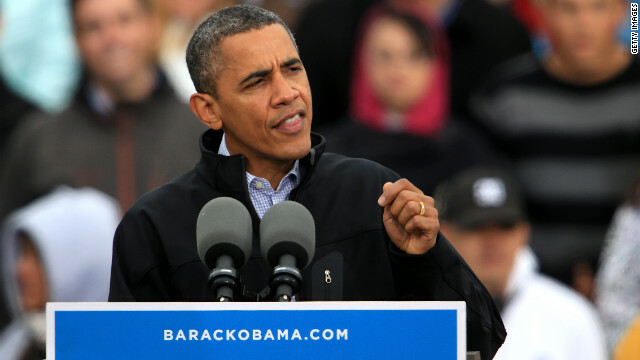 Cash is King – send money and vote for Obama! Why is no one calling out Obama on the blatant lies he told at the debate? He claimed to have lowered taxes 18 times for small business. What? Claimed that businesses that ship jobs overseas get a tax break. He had no answer when Romney called him out on that lie. In fact, does everyone forget how he cozied up to GE and then GE announced they were opening a plant overseas? I just don't get the love affair that the media is having w/ Obama. Dear Amom: It was not Obama who lied. It was Mitt Romney who lied during the debate. Yes, President Obama has lowered taxes 18 times for small businesses. Check the facts. And, businesses get tax breaks. It does not say explicitly that it's for that reason, but they do. Get your facts right. And if Obama was so cozy with GE, how come yesterday Jack Walsh accused the administration of cooking the jobs/unemployment numbers. You don't make sense. NO – it was romney WHO LIED THE ENTIRE DEBATE – do some fact checking will ya! Fact checkers said he told 27 lies within 38 minutes! Obama is right – there IS a tax break for shipping jobs over seas – why the hell else do you think they do it? and MITT is right in the middle of all that – playing dumb that he didn't know...what a complete farce he is -vote OBAMA/BIDEN 12 and DEMS all the way down the line – it is dummies like amom up above that will be hurt the worse because they are LOW INFORMATION voters!